Dr. B. Siva Kumari Head, Department of Botany attended one day seminar on 'ACADEMIC LEADERSHIP TRAINING' on 25-10-2012 at Andhra Loyola College, Vijayawada. 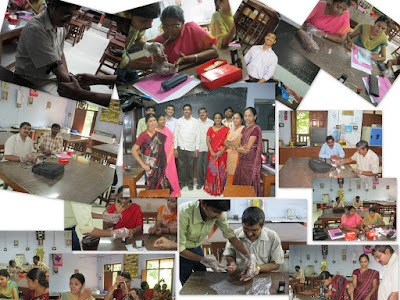 staff retraining workshop for the staff in Molecular Biology and Horticulture techniques on 15th to 17th Oct, 2012. 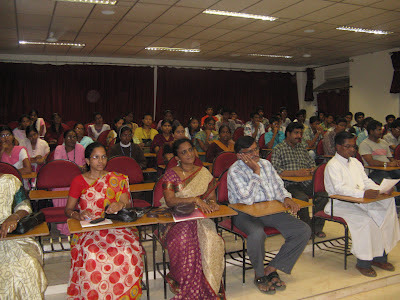 The Department of Botany organized a guest lecture on BIODIVERSITY-SUSTAINABLE DEVELOPMENT on 5th October 2012 at Seminar hall. 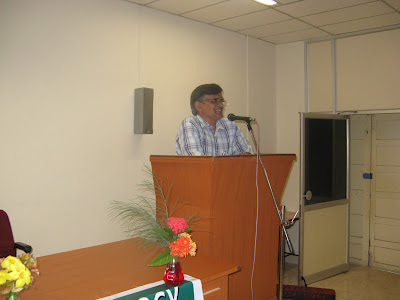 Dr. M. Raghu Ram, Asst Professor at ANU. He emphasized on “Usage” and “Utilization” of natural resources and human responsibility for conservation of Nature. Dr. Raghuram emphasized on the -Biological diversity - or biodiversity - is a term we use to describe the variety of life on Earth. It refers to the wide variety of ecosystems and living organisms: animals, plants, their habitats and their genes. Loss of biodiversity - the variety of animals, plants, their habitats and their genes - on which so much of human life depends, is one of the world’s most pressing crises. It is estimated that the current species extinction rate is between 1,000 and 10,000 times higher than it would naturally be. The main drivers of this loss are converting natural areas to farming and urban development, introducing invasive alien species, polluting or over-exploiting resources including water and soils and harvesting wild plants and animals at unsustainable levels. Role of IUCN- IUCN has access to many different kinds of information on species. The Red List of Threatened Species™ provides global assessments of the conservation status of species. The IUCN Species Survival Commission, together with the Species Programme and their partners have developed a number of approaches to build up a comprehensive picture of the status and trends in species and biodiversity at global, regional and national levels. S.Laksmi Bharath, (DB-13) won the First Prize in Oral Presentation at the World Wild Life Week organized by KBN college, Vijayawada, on 04.10.2012. G.Sushma (DB-14) won the Second Prize in PowerPoint presentation at the World Wild Life Week organized by KBN college, Vijayawada, on 04.10.2012. J.Jacob samuel Raj (DB-6) won the Consolation Prize in PowerPoint presentation at the World Wild Life Week organized by KBN college, Vijayawada, on 04.10.2012. J.Jacob samuel Raj, DB-6, was a member of the team which won first prize at AURA-2012, a State level youth fest conducted by St.Anne’s College, Eluru on 27-11-2012. J.Jacob Samuel Raj, (DB-6) was a member of college quiz team that won the quiz in Nalanda Degree College, Vijayawada. 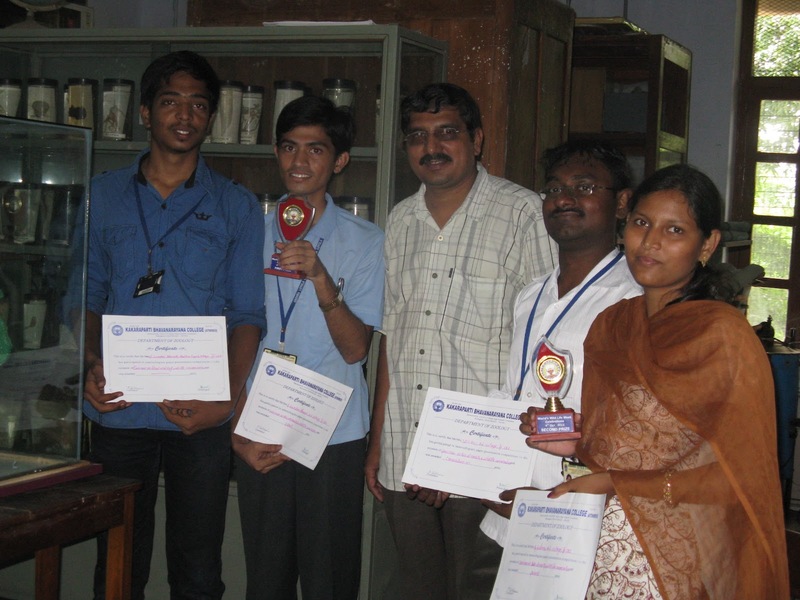 J.Jacob Samuel Raj (DB-6) won the second prize in the event Just a Minute at the BIOFEST-2012 organized by S.V.Laksmi Degree College, Kakinada, on 10-12-2012. N.Leela Prasad (DB-04) had been a volunteer in the survey on HUMAN ANIMAL CONFLICT in grass lands of Maharasthtra by Centre for Wild life studies from 12-1-2013 to 20-1-2013. 1. S. Lakshmi Bharath (DB-13) won the Second Prize in the singing completion held at Vasvya Mahila Mandali, Vijayawada, on “Eye Donation”. 2. N. Leela Prasad (DB-4) won the second prize in “Yuvatha” organized by Ground Water Department, AP. I,II & III PRIZE WINNERS IN THE INTER-COLLEGIATE COMPETITIONS HELD AT K.B.N COLLEGE.